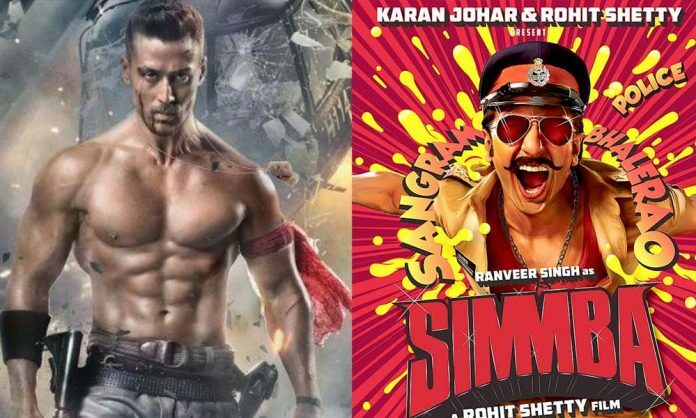 Rohit Shetty’s Simmba starring Ranveer Singh and Sara Ali Khan fails to beat the day 1 collections of Sajid Nadiadwala’s action entertainer Baaghi 2 which stars Tiger Shroff and Disha Patani. While Baaghi 2 had garnered 25.10 Cr on day 1 despite band in various regions, Simmba collects 20.72 Cr on it’s opening day. Simmba which is backed by Rohit Shetty who is known for his larger than life movies also stars Ranveer Singh and Sara Ali Khan in the lead role. The film has also treated the audience with chartbusters Which created a rage. Baaghi 2 on the other hand is backed by Sajid Nadiadwala and Ahmed Khan which stars Tiger Shroff and Disha Patani in the lead role. The release of Baaghi 2 had created many records at the box Office. Baaghi 2 also marks the highest opener for Tiger Shroff. Touted to be 2018’s masala entertainers, Both the films treat the audience with high octane action sequences. Tiger Shroff’s power-packed action has been the talk of the town ever since the film’s release. With Baaghi 2, Tiger Shroff’s power has left behind his contemporary Varun and Arjun too at the box office. Not just that, Tiger Shroff has also emerged as the youngest Bollywood actor to clock the fastest century. The actor also becomes the only gen next actor to have a massive opening on day 1. Next articleElated Sara Ali Khan Watches Kedarnath And Simmba, Thank Fans For Their Love!